It was a weekend to remember for MMKAC as they retained two major athletics titles at the Bucks AA Cross Country Championships. The senior men won the title for the 28th time since they first won the Charles Allen Trophy 40 years ago, while the senior ladies won for the sixth time in a row. There was a perfect 1-2-3 from the ladies. Around the three lap 10km undulating course in the grounds of Shuttleworth College, Lara Bromilow and Elle Roche set the pace running side by side for the opening lap but on the second lap Lara, the defending champion gradually pulled away from her team-mate. She extended her lead to win by almost a minute whilst Rachel Robinson, running an almost solo third place completed the winning team, just inside a minute in arrears. Alex Knowles placed 11th (2nd F45), Debra Brent 13th (3rd F45) and Diane Farmer 15th (2nd F55). 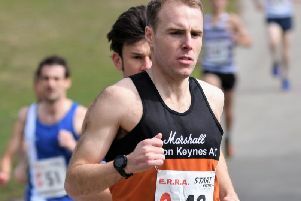 The senior men faced a four-lap course of some 13km and included MMKAC’s Steve Tuttle, the defending champion. However on the day he found some tough opposition from Alex Goodall(Windsor) who led from the start to win convincingly in 47.24. Steve had to settle for bronze this year but led the scoring men’s team of six to a comfortable victory over Chiltern Harriers. James Tuttle placed 6th with Paul Mizon, making a very encouraging debut for the team in 8th. Tom Comerford continued his comeback after a long injury lay-off finishing 12th whilst Steve Herring and Jeremy Vick battled away for the 5th and 6th scoring places, 15th and 17th on the day. The under 20 men ran three laps with the seniors and produced gold for MMKAC’s James Minter. The men 60+ raced over 10km where Phil Jones had to take silver this year after winning at Stowe last year, Paul Mason closed in 4th. Montana Edghill led throughout the Under 17 Womens’ 6km race for an inspired victory with Anna Ustaran-Anderegg 13th. There were individual bronze medals in both the Under 13 and Under 15 girls races. Imogen King was just 6-seconds off silver for the latter team and with Jodie Brogden 9th and Chloe Munro 13th they closed in third team place. Sonja De Koning was involved in a very close finish in the Under 13 race as just 2-seconds separated the medallists, but unfortunately ended with the bronze medal. Morenike Orimalade placed 15th and Millie Freeland 16th to give the team third position.